, an eminent painter, was born in the village of Peene, near Cassel, in 1658, of parents extremely poor, and seemed destined to rise in the world by slow degrees. His mother, who was a widow, lived in the country on what she earned by washing linen; her whole wealth consisted in a cow, which her little boy used to lead to pick up its pasture by the side of the ditches. One day Corben, a famous painter of landscapes and history, going to put up some pictures which he had made for Cassel, as he went along the road, took notice of this lad, who had made a fortification of mud, and little clay" | figures that were attacking it. Corbéen was immediately struck with the regularity and taste that was evident in the work. He stopped his chaise, and put several questions to the lad, whose answers increased his astonishment. His figure and countenance added to the impression; and the painter asked him whether he would go and live with him, and he would endeavour to put him in a way of getting his bread; the boy said he would willingly accept of his offer, if his mother would but agree to it. Elias failed not to be at the same place on the day appointed, accompanied by his mother; he ran before the chaise, and Corbéen told the woman to bring her son to him at Dunkirk, where he lived. The boy was received, and the master put him to school, where he was taught the languages, and he himself taught him to draw and to paint. The scholar surpassed his fellow-students: he acquired the esteem of the public, and gained the favour of his master to such a degree, that he sent him to Paris at the age of twenty; whence Elias transmitted his works to his master and benefactor. With great gentleness of character, he possessed the good quality of being always grateful; he thus repaid his master for his kindness to him, as Corbéen frequently confessed. Elias, after having been some while at Paris, married. He made a journey to Dunkirk for the purpose of visiting his master, and it was while there that he painted a picture for the altar of St. Barbara’s chapel, in which he represented the martyrdom of that saint; a fine composition. 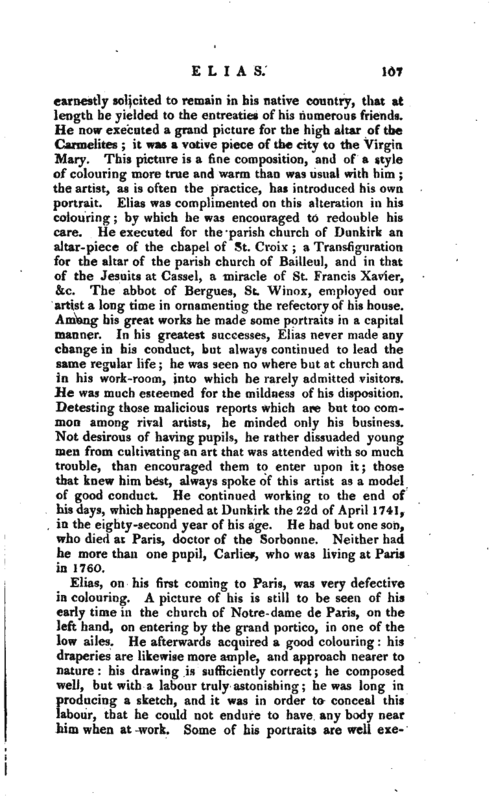 On his return to Paris, he was appointed professor at St. Luke, and successively obtained several other posts. He was much employed, and composed several subjects taken from the life of St. John Baptist de la Barriere, author of the reform of the Feuillants. All these subjects were painted on glass, by Simpi and Michu, and are in the windows of the cloister. Elias, now become a widower, took a journey to Flanders, in hopes of dispelling his grief. Being arrived at Dunkirk, the brotherhood of St. Sebastian engaged him to paint their principal brethren in one piece; he executed this great picture, with a number of figures as large as life, and some in smaller dimensions. 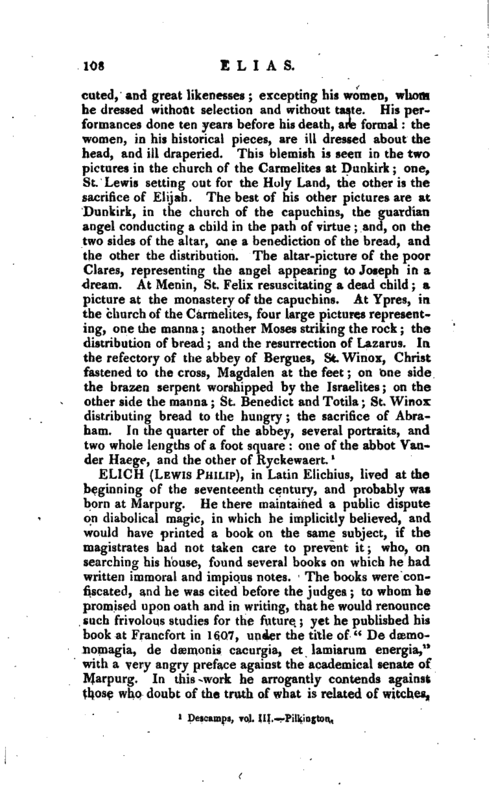 The company of taylors having built a chapel in the principal church, Elias was employed to paint the picture for the altar, in which he represented the baptism of Christ; in the fore-ground is St. Lewis at prayers, for obtaining the cure of the sick. Being now on the point of returning to Paris, he was so | earnestly solicited to remain in his native country, that at length he yielded to the entreaties of his numerous friends. He now executed a grand picture for the high altar of the Carmelites; it was a votive piece of the city to the Virgin Mary. This picture is a fine composition, and of a style of colouring: more true and warm than was usual with him the artist, as is often the practice, has introduced his own portrait. Elias was complimented on this alteration in his colouring; by which he was encouraged to redouble his care. He executed for the parish church of Dunkirk art altar-piece of the chapel of St. Croix; a Transfiguration for the altar of the parish church of Bailleul, and in that of the Jesuits at Cassel, a miracle of St. Francis Xavier, &c. The abbot of Bergues, St. Winox, employed our artist a long time in ornamenting the refectory of his house. 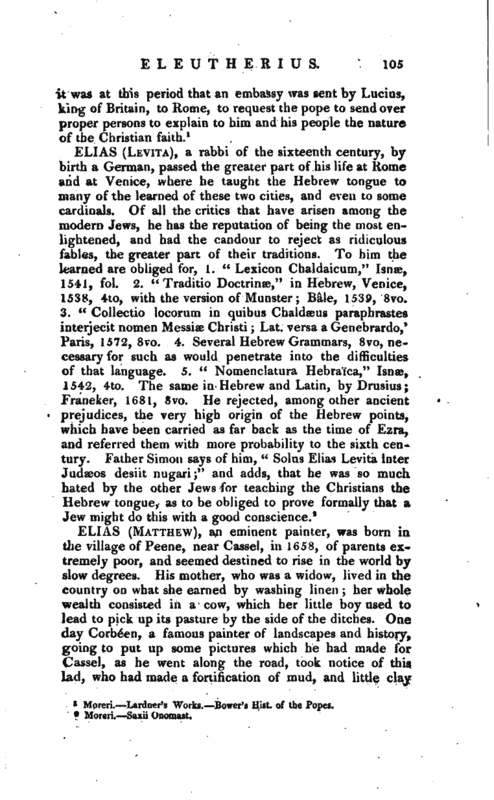 Among his great works he made some portraits in a capital manner. In his greatest successes, Elias never made any change in his conduct, but always continued to lead the same regular life; he was seen no where but at church and in his work-room, into which he rarely admitted visitors. He was much esteemed for the mildness of his disposition. Detesting those malicious reports which are but too common among rival artists, he minded only his business. Not desirous of having pupils, he rather dissuaded young men from cultivating an art that was attended with so much trouble, than encouraged them to enter upon it; those that knew him best, always spoke of this artist as a model of good conduct. He continued working to the end of his days, which happened at Dunkirk the 22d of April 1741, in the eighty -second year of his age. He had but one son, who died at Paris, doctor of the Sorbonne. 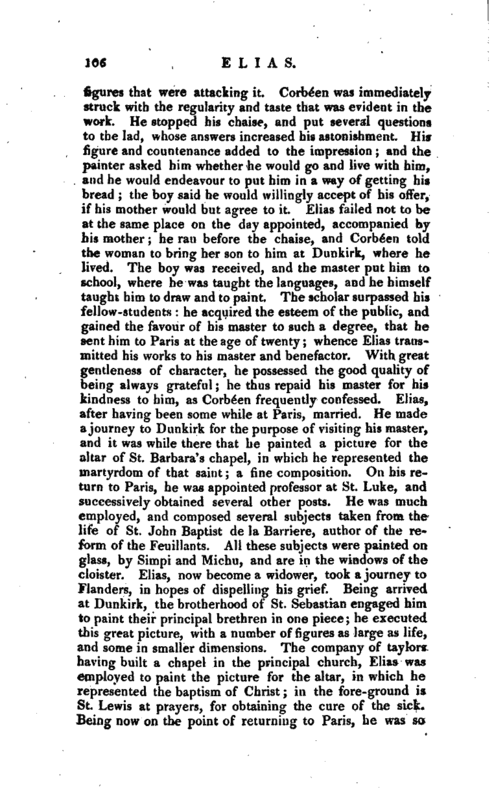 Neither had he more than one pupil, Carlier, who was living at Paris in 1760. 1 Descamps, vol. III. Pilkington.